cPanel has grown to become the most popular web hosting control panel, running millions of websites around the world. 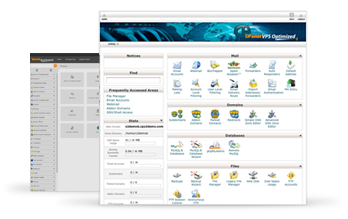 cPanel was created to give server and website owners control over their properties. Whether you’re managing one, or hundreds of websites, cPanel software’s user friendly point-and-click interface allows you to customize your web hosting experience to fit your needs. cPanel software provides several web-based interfaces for checking email, including Horde, Roundcube, @Mail, and SquirrelMail. You have the ability to access your email from any web browser, as well as configure many account options including email forwarding and auto-responders. cPanel users can set up email forwarding which allows account holders to have an address at one domain (such as webmaster@example1.com) and forward incoming messages to another (such as your-name@example2.com). cPanel software offers a range of built-in log file statistics. Through log processing programs such as Webalizer and AWStats, you can see how many times your websites have been visited and how much email you’ve been sending. Available on our Web Hosting and Reseller Hosting plans.